Next up in the installment of "I'm too tired to do much besides throw together a quick dinner" is peanut chicken. I wanted something that combined chicken satay and it's delicious peanut sauce, but that didn't involve grilling (because I'm too lazy to heat up the grill) or the oven. 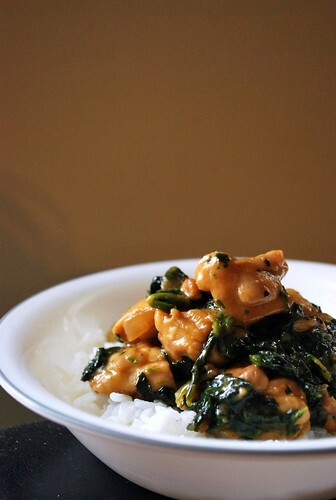 I cubed up the chicken and cooked it in some peanut sauce, and tossed in some spinach and served it over rice. Heat the oil in a medium sized pan, then add the onions and garlic. Cook until softened, then push to the side and brown the chicken. Stir together everything except the spinach in a small bowl, and then pour over the chicken mixture and cook for 10 minutes or so, until the chicken is cooked through. Stir in the spinach and cook another minute or two until it's cooked through. Wow! Saw this on Tastespotting and I had to see for myself! 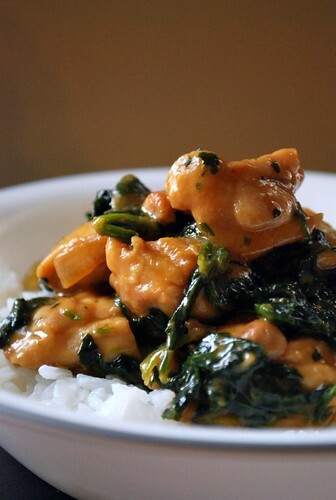 Fantastic dish and recipe and I've just bookmarked it! Looks simply luscious! Your dish looks so good and clean! Yum! Trying this one next week. Hey, just made this and it is delicious! I subbed coconut sugar for the brown sugar (lower glycemic) and added a little coconut milk, and used Bragg's Liquid Amino's instead of soy sauce, since I'm allergic to the alcohol in even gf soy sauce. Thanks! I've always been a little leery of peanut sauce recipes...never thought it would taste as good as the restaurant's, but I trusted you! btw,looks like Children's books fan is spamming comments, left an identical comment on my site. Just fyi. Our family loved this. And it was so easy to make. Thank you for sharing!